Oliver’s horses were on fantastic form at Blair. At the end of the dressage phase in the CIC3* Oliver held first, second, third, sixth and 12th places, on Cooley Master Class, Cooley SRS, Ballaghmor Class, MHS King Joules and Tregilder respectively. 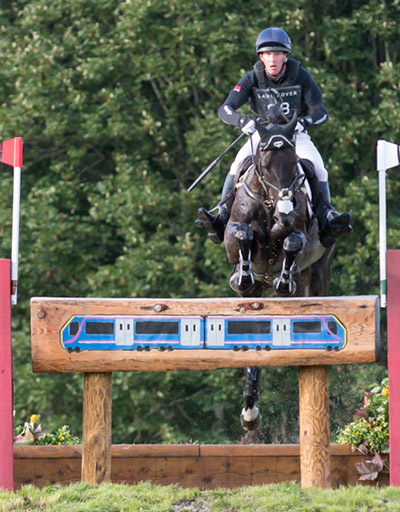 Ballaghmor Class and MHS King Joules both had a rail down, but this was academic – Oliver withdrew all bar Tregilder before the cross country, because they are all entered for Burghley and Oliver has yet to decide which horses he will run there. Tregilder was making his three star debut, and Oliver had said that he was only there to gain experience. However, he made nothing of the cross country challenge crossing the finish line six seconds inside the optimum time (the only horse to make the time) to take the win. In the ERM Cillnabradden Evo narrowly led the dressage, but had to settle for eventual second place after picking up a smattering of cross country time penalties in the wet conditions – still an excellent result. Oliver’s remaining ride was a new one – Crumlinpark Genie who Oliver had only sat on twice before Blair. It was a good start to the relationship with a clear inside the time across country in the horse’s first three-day event.